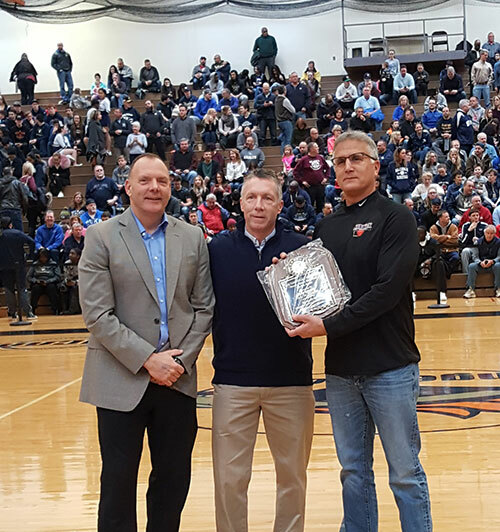 The Jim Taravella Award is given annually to an Orange County basketball coach in memory of beloved former Monroe-Woodbury boys varsity basketball coach Jim Taravella, who passed away unexpectedly on December 13, 2006. The selection process is conducted by the varsity basketball officials of the Orange County Basketball Officials Association, and is based on coaching qualities possessed by Jim Taravella – such as dedication, sportsmanship, and compassion in the role as a coach in the game of basketball. The 2016-17 recipient of the Jim Taravella Award is Warwick Boys Varsity Basketball Coach Tom Folino. Pictured, left to right: Warwick Athletic Director Greg Sirico, Basketball Officials Representative John Leigh and Warwick Boys Basketball Coach Tom Folino.